Images of the U.S.-Mexico border. Central photo: Stretch of the Rio Grande drying up in February 2003 in the Big Bend National Park, Texas (USGS photo by John Klein). 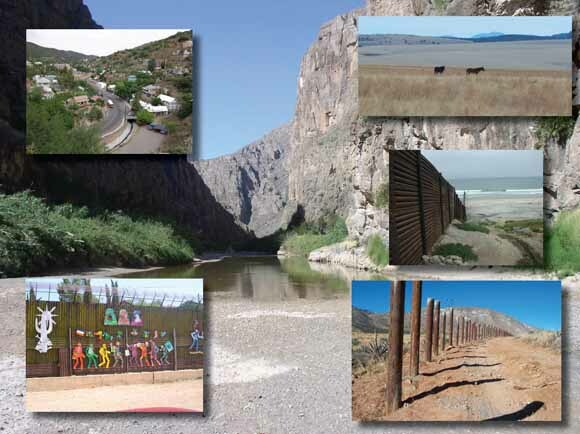 Insert photos (clockwise from upper right): (1) Rangelands looking south into Mexico from the eastern edge of the San Rafael Valley, south of the Huachuca Mountains, Arizona (USGS photo by Bruce Gungle); (2) border fencing at California coast (photo by Chris Lukinbeal, Arizona State University); (3) vehicle barrier, Coronado National Memorial at the International Boundary with Mexico ((USGS photo by Bruce Gungle); (4) artwork on the border wall at Nogales, Sonora, Mexico (photo by Gigi Owen, University of Arizona); (5) view from Castlerock of street and houses in colonia of historic Bisbee, Arizona (USGS photo by Laura Norman). For questions about the content of this report, contact Laura Norman.